1. She’s old. I don’t mean old in human years, but old in terms of political shelf-life, and it will cost her with young voters. The young are notoriously fickle when it comes to love and merchandising. Music, clothing trends, social media sites, and boyfriends have a short run before they become “so five minutes ago.” There is nothing novel about Hillary. For most young voters (the 18-21 year old crowd), Hillary is an artifact of a decade that that barely remember, if at all. Like the internet and cellphones, she’s always been around. She lacks the freshness and coolness of a Barack Obama in 2008. Young voters tend to be attracted to what’s new, different, and fresh. Call it the “Hipster Paradigm” of voting. Hillary is an old brand; America on Line trying to rebrand itself as SnapChat. If Hillary thinks she can count on the youth vote like Obama did in 2008, she better think again. 2. She has no vision. Ask people why Hillary is running and they’ll tell you “because she wants to be president.” That’s obvious. What Hillary lacks is a compelling narrative as to why she is running. Obama was able to shroud his candidacy in “Hope and Change,” and as vacuous as that was it was a compelling story for both the media and voters. A whole lot of people bought into it. Hillary has no such story other than she wanted to be president in 2008 and got beat by the Hope and Change guy. The danger for Hillary is that she not only fails to provide a compelling reason to vote for her, but she creates an opening for someone who does have a vision. Witness the success of Bernie Sanders. Bernie is starting to attract large crowds, especially among young voters, who are drawn to his vision of America where everyone shares and nobody struggles. Yes, most of it is nonsense, but he believes the nonsense and it is easy to get caught up in the passion and sincerity of his dream. Hillary better watch out. 3. Symbolism is Dead. Obama was able to capture public desire to break the mold of the American presidency. It was supposed to be Hillary’s wave, but Obama (from Hawaii and a better surfer) cut her off and rode in to victory. Many voters supported Obama simply on the basis that they wanted to create a historic moment. Now that the mold has been broken, Hillary’s call to “elect the first woman president” rings hollow. It’s especially weak since it comes primarily from her. Obama went to great lengths to avoid calling attention to race or the historic nature of his candidacy. He let others make the case for him. So far the only person making the case for Hillary as the first woman president is Hillary. See problems 1 and 2 above. 4. She’s a bad debater. When the primary season kicks up, Hillary will have to go face to face with somebody. It’s probably Bernie Sanders, Martin O’Malley, and maybe Elizabeth Warren (doubtful) or Jim Webb. Regardless, there will be debates. Hillary can’t expect to skip this tradition without looking like she’s avoiding the press (again). 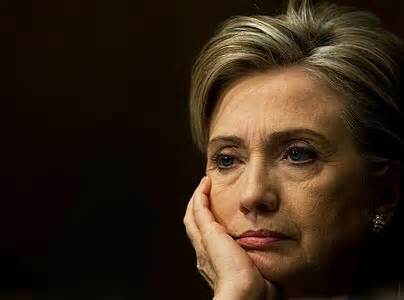 While the Republicans are gearing up for their first debate on August 6th, expect Hillary to put debates off as long as possible and agree to a very limited number. Hillary is not a great debater. She can come across as self-absorbed, condescending, and calculating. Her handlers know this and try to keep her away from the press as much as possible. Debates are the worst possible venue for a candidate like Hillary because they expose her in the worst possible way – unfiltered, unscripted, and unflattering. 5. Scandal. Hillary’s supporters don’t like to talk about it, but she’s plagued by scandal. If she were a Republican, she’d be done by now. The press has largely ignored the State Department email scandal and the Clinton Foundation Donor controversy because they don’t want to be kicked off the already elusive campaign detail. Plus, they’re ideological bedfellows with Hillary though many see her as an opportunist rather than a true progressive. These scandals won’t go away, but they won’t get investigated either. Her Democratic opponents won’t bring them up because they know the short-term gain isn’t worth the long-term cost of alienating the Clinton powerhouse and a potential future president. But her Republican opponent won’t be so kind in the general election, and these scandals will cost her support with the moderate, undecided voter. Hillary will be the Democratic nominee. There is no doubt about that. However, there is a sense among Democratic party members that the ship has already hit the iceberg, and that it’s best to put on a good face while the deck begins to tilt. But come the general election, those youth voters who were so enamored of Obama (though the love is largely gone), new voters and the mushy middle of our electorate who vote on idealistic visions and dreams of a better tomorrow may find a life-raft in a younger, more optimistic, and cleaner candidate from the opposition party. With the right candidate, the Republicans have a real opportunity to take the White House, and Democrats know it. Sixth reason – the Democratic party historically does not choose the establishment candidate for the nominee. Examples – Carter, Bill Clinton, Barack Obama.